The way that the Seto Inland Sea was formed, through subsidence and erosion over millions of years, gives the present day visitor the delights of winding coastlines and a wide choice of islands. The sheltered coastline provides the perfect location for harbours and ports, with the natural inlets and the windbreak provided by the islands, allowing safe havens for sea-goers, although the lay of the land means that the mountains and hills had to be taken into account. 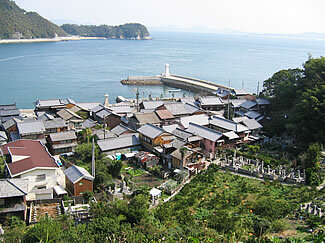 The harbours and port towns of the Set Inland Sea grew around tiny accessible areas along the coastline. Visitors can enjoy creeks surrounded by islands, winding paths through the hills, and intimate little towns. The Seto inland Sea is a semi-enclosed sea, and the tides coming in from both east and west make subtle changes to the currents. The tides and currents have both affected the way the ports and harbours have grown, giving us the saying "A harbour for waiting for the tide" to describe many of these small towns. One of the most endearing features of the harbours and ports must be their rich cultures and history. 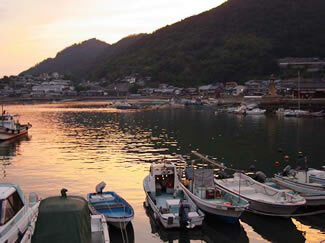 Over the centuries, the sea has been the first point of entry into Japan, the "Country of Islands". The sea has seen uncountable vessels bringing merchants and traders, and each port has its own records of the coming and goings of the ships over the centuries. The harbours and ports have brought together nature and humans, and this is evident in the culture, festivals, cuisine, and uniquely attractive traditions which you will find in your travels around the area - you can feel the history!